The next classic for your adventurous child's library! A zoo train full of children takes a mysterious turn into the wilds. As each train trip becomes more and more wild, curious children observe the whimsical world around them! 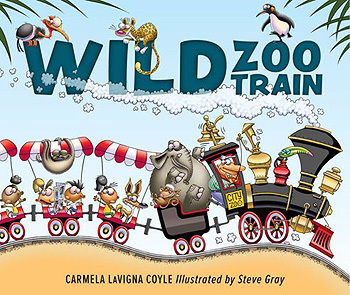 Written by Carmela and illustrated by Steve Gray, of There Was a Coyote Who Swallowed A Flea fame, Wild Zoo Train takes readers on a wild, animal-filled adventure through canyons, jungles, and beyond! "Choo-choo-choo goes the Wild Zoo Train. Ding-ding-ding goes the bell on the roof. Clickety-clack go the wheels on the track..."
Ding-ding-ding! The Wild Zoo Train Activity Kit is loaded with fun and educational tie-ins to the book!